I’ve used Google Analytics, like most of you, I’m sure. But to be honest, I’ve always been slightly overwhelmed with it, too. I know there are a lot of analytics options out there, like Chartbeat for real-time, user-friendly information, and Crazyegg for interesting visuals like heatmaps for click-through rates and scrolling patterns. 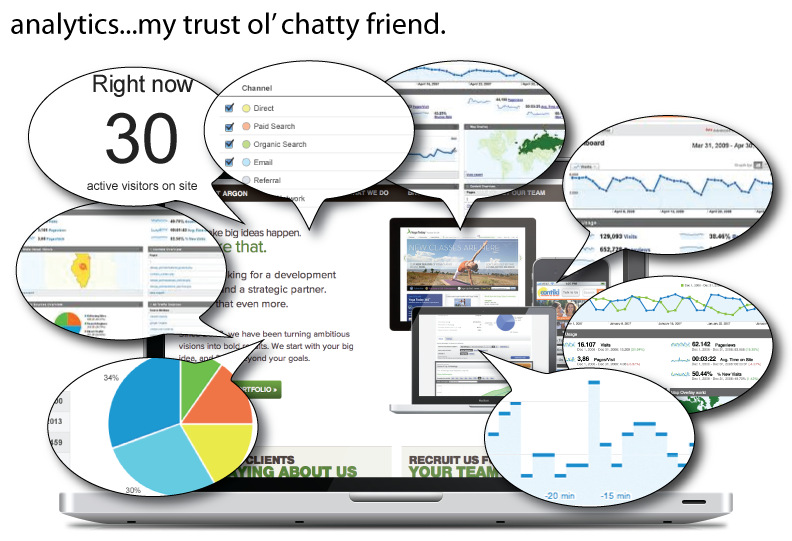 But, despite some hardships, Google Analytics has always felt like that trusty old friend…that one that talks too much. You know the type. The friend that gives just a little too much detail to a story to successfully get the point across (and you’re lucky if you don’t get sidetracked into some sort of tangent). Today I had the opportunity to attend (listen to?) 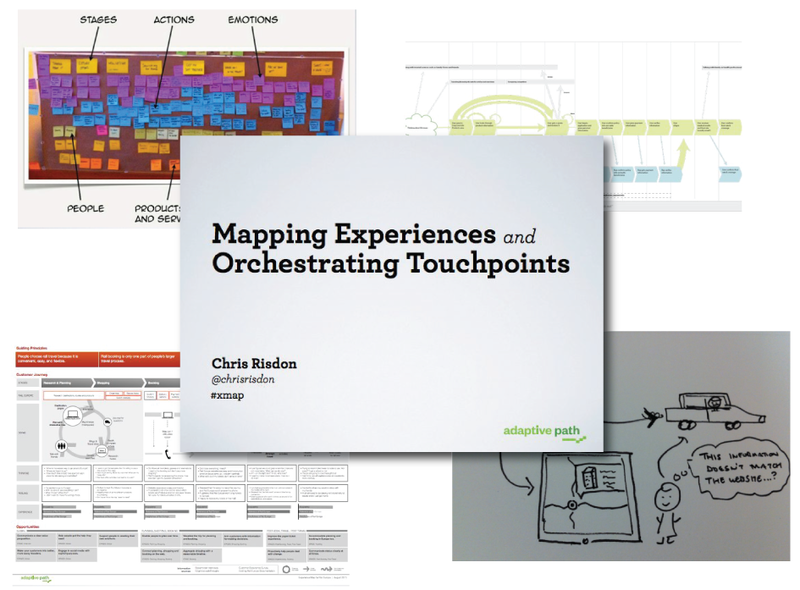 one of Adaptive Path’s virtual seminars covering experience maps led by Chris Risdon. Does social media improve the bottom line? Does this suggest that social media campaigns are effective, or that the kind of companies that invest in social media are more likely to improve their bottom line, or both? In a controversial move, online travel agency Orbitz has started driving Mac computer users toward more expensive hotels. This bold strategy is based on the website’s tracking research, which indicated that its Mac customers spend up to 30 percent more on travel than its Windows clientele. A user’s platform is just one metric that is being utilized to present the most effective marketing experience to browsers. MDG present the pros and the cons of mobile apps vs. mobile websites in a handy infographic. We recorded a new podcast last week discussing our recent white paper about the benefits and drawbacks of responsive and mobile-specific design. Listen as we talk about screen sizes, mobile devices, browsers and Annie’s true opinion of her fingers. You can also check out our previous podcasts and subscribe in iTunes so you won’t miss another exciting episode! A mobile-specific solution or responsive? Bryson Meunier has posted an article that outlines some rationale for why some businesses, such as restaurants, are better off with a mobile-specific version of their site instead of a responsive one. Our team is currently working on a series of white papers and have just finished our first one, which introduces businesses to two strategies for designing and developing a site that targets mobile traffic. Given that we've approached several projects from both angles, we felt that it would be worthwhile to share our experiences of each with you. You can now get our white paper, "Responsive Design vs Mobile Site" on "our new white papers page":http://planetargon.com/white-papers/responsive-design-vs-mobile-site. For any e-commerce site, I have the perfect advice on how to raise their conversion rate significantly. All they have to do is stop marketing. Once they stop marketing, the number of visitors will drop to only those who are already loyal customers. Because those visitors are loyal, they are probably only coming to buy something. The ratio of purchasers to visitors will skyrocket. Sales will likely drop, but conversion will go sky-high. Sounds great, right? That’s the other problem with the conversion rate ratio: it’s not at all related to the other business operations. Let's avoid getting too focused on conversion rates. In terms of mobile trends, what is perhaps even more significant than the above statistic is this: The average U.S. smartphone subscriber spent 441 minutes engaged with either the Facebook app or mobile site. This is in comparison to the 391 minutes that the average Facebook user spends interacting with the desktop site. Yowza! Mobile! I expect to see the same trends when I check the analytics of my soon-to-be wildly popular dating site, OkDeluded (OkStupid was taken).